Will This Weapon Change Infantry Warfare Forever? The U.S. Army is about to acquire a new weapon that could dramatically impact infantry warfare. The U.S. Army is introducing a new shoulder-fired weapon that has the potential to change infantry tactics and revolutionize infantry warfare in a way unseen since the Battle of Königgrätz in July 1866. 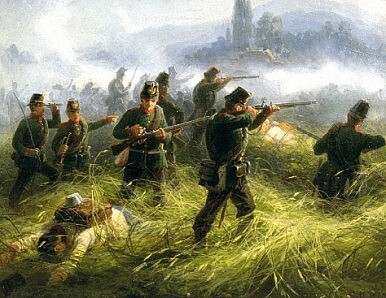 That battle, which marked the beginning of the end of the line infantry attack, saw Austrian troops carrying muzzle-loaders outgunned by Prussian infantrymen carrying breech-loading needle guns. According to its fiscal year (FY) 2017 budget request, the U.S. Army will produce 105 so-called XM25 Counter Defilade Target Engagement (CDTE) weapons, a precision-guided grenade launcher, and distribute them among specially trained soldiers. “Accordingly, the army has requested $9.764 million in FY 2017 for the program and hopes for $14.852 million in FY 2018, $24.930 million in FY 2019, $32.158 million in FY 2020, and $25.798 million in FY 2021,” IHS Jane’s Defense Weekly reports. For now, not much will change on the battlefield for dismounted soldiers in combat. However, once the weapon is distributed more widely at the squad level throughout the U.S. military, the impact of the XM25 could be revolutionary and fundamentally change small infantry tactics. The XM25 will essentially destroy the value of cover and with it the necessity of long-drawn out firefights. It will also make the old infantry tactic of firing and maneuvering to eliminate an enemy hiding behind cover obsolete. The U.S. Army has already tested the weapon in combat in Afghanistan. There, the weapon received mixed reviews by soldiers using it. “Ranger units found the XM25 too heavy and cumbersome for the battlefield. They were also concerned that the limited basic load of 25 mm rounds was not enough to justify taking an M4A1 carbine out of the mission,” according to military.com. Yet, some of the U.S. Army units that employed the weapon remarked that the weapon ended so-called troops in contact (TIC) events very quickly. “Many of the squads that took it on patrol did not want to give the weapon up when the trial employment was concluded,” according to a senior U.S. military official interviewed by The Diplomat. The weapon’s potential revolutionary impact on infantry tactics is undeniable. “The introduction of the XM25 is akin to other revolutionary systems such as the machine gun, the airplane and the tank, all of which changed battlefield tactics. No longer will our Soldiers have to expose themselves by firing and maneuvering to eliminate an enemy behind cover. Our Soldiers can remain covered/protected and use their XM25 to neutralize an enemy in his covered position,” wrote an officer of the U.S. Army Program Executive Office Soldier in 2010.